Mr Fluff and I do like a good his ‘n’ hers scent. Back in the day we wore copious amounts of Calvin Klein’s Obsession, and more recently, we’ve almost come to fisticuffs over who gets to use ‘our’ bottle of Bottega Veneta Pour Homme. So the new incarnation of CK One sounds right up our alley. Launching this February the two new fragrances sound absolutely delicious. 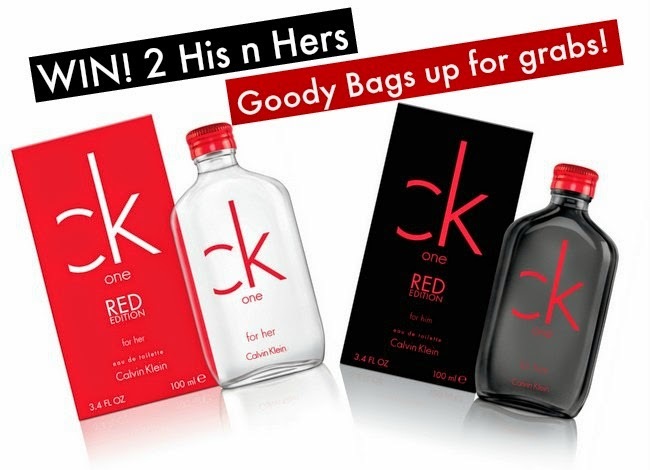 CK One Red Edition for Him begins with juicy pear, before revealing a heart of suede, black pepper and ginger on top of vetiver, tonka bean and musk. The fragrance for her starts with notes of fresh, fruity watermelon and violet leaves, progressing to white florals and a blend of velvety musks on the dry down. Now for the good news: I have two goody bags, worth over €60 each to give away – both containing a male and female version of the 50ml fragrance. Fancy getting your hands on one? Just pop in your details below. Please make sure you complete all the steps as it would break both our hearts if you won, but had to be disqualified for not completing your entry. This one is open on the island of Ireland only, and the site's standard competition policy applies.